1 Feb 2019 – It’s a moral disgrace when the EU Parliament, which lectures the world on the need to respect the rule of law, uses legal language to tell lies about the legality of the situation in Venezuela, and to destroy that legality. Indeed, Brussels’ vote in favour of recognition is even more absurd than recognising Marine Le Pen because, unlike her, Juan Guaido has never been a candidate in his country’s presidential election, let alone been elected to it, and until a few weeks ago no one, not even in Venezuela, had even heard of him. That they did this, and that the common resolution was then voted by all but 100 or so MEPs, is a frightening illustration of power of groupthink. Or perhaps it is just dishonesty. No one who has ever read Article 233 of the Venezuelan constitution could possibly conclude that it says anything of the kind. 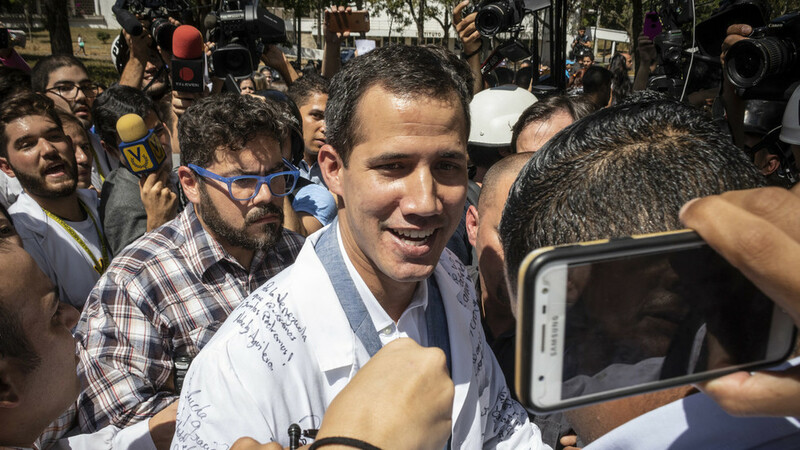 On the contrary, Article 233 is precisely what Juan Guaido violated when he performed his little stunt of proclaiming himself president in a public square in Caracas on January 23. It lists six circumstances in which his term can be cut short: if he dies; if he resigns; if he is removed from office by a ruling of the country’s supreme court; if he is proclaimed physically or mentally unfit after a formal medical procedure validated by the National Assembly and by the supreme court; if he abandons his office; or if he is impeached by a popular referendum. Not a single one of these conditions has been fulfilled: President Maduro has not resigned; he is not dead or unfit; he has not been impeached by the courts or by the people. Worse, Article 233 goes on to say who takes power if the presidency falls vacant – which it has not – and, guess what? It specifies that it is the vice-president who takes over, in this case Mrs Delcy Rodriguez, not the president of the National Assembly (Guaido). The only circumstance in which the president of the National Assembly takes over is if the president has not been inaugurated. As Maduro has been president since 2013, it is impossible to pretend that this is the case. He took the oath of office for his second term on January 10, in front of the president of the Supreme Tribunal of Justice. So, the form of inauguration which Maduro’s enemies from Venezuela’s former colonial power in Europe claim is anti-constitutional is, in reality, specifically provided for in the constitution. As Mr Pons also knows perfectly well, although he chooses to hide this too from his readers, there is a very good “supervening reason” why Maduro could not be sworn in before the National Assembly. It is that it was dissolved in 2017 for electoral fraud. The assembly had sworn in members whose elections had been declared invalid by the Supreme Court, which incidentally is the guardian of the constitution when it comes to electoral disputes. In all other circumstances – in Poland, for instance, or in Hungary – members of the European Parliament typically demand that judges be given total independence and the right to overrule the decisions of elected assemblies if they deem laws anti-constitutional. On Venezuela, by contrast, MEPs deploy precisely the opposite argument: the European Parliament pronounced in its resolution that the (dissolved) National Assembly was the only legitimate body in Venezuela, i.e. that the Supreme Court has no legitimacy. It is obvious that there is a serious political crisis in Venezuela, between a presidency elected by universal suffrage and a political class in the parliament which opposes him. For foreign powers to wade into such a crisis is politically foolish and incidentally quite illegal under international law. But when a body like the European Parliament, which lectures the whole world on the need to respect the rule of law, uses legal language to tell outright lies about the legality of the situation in another country, and to destroy that legality, it is a moral disgrace.